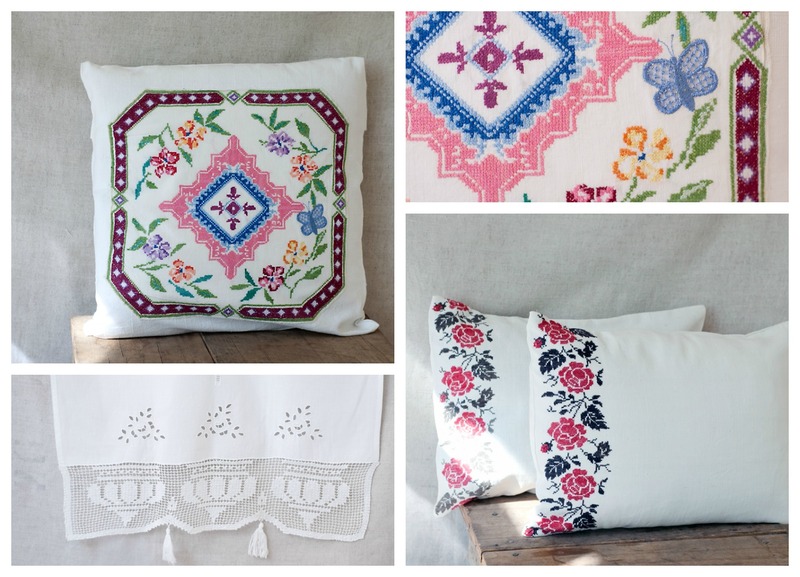 My pillow covers made of vintage linen with cross stitch embroidery - a set of two linen shams with roses and leaves, and one square pillow with flowers and a butterfly (the cut out details are lovely) are perfectly in line with this nostalgia for rustic simplicity. I am looking for something we used to have, and then got rid of; I miss the smells and feelings. The white curtains with crocheted lace and embroidery are also from that part of life which is over. I wish I had at least three houses; one for this rustic style, linen and wood; another one for oriental lavishness with rich colors and luxurious fabrics; third one for clean Japanese simplicity with exquisite details. I would be moving between the houses depending on my mood. As it is now, I have to look for some sort of a balance in my only house. I also like these pillows covers with cross stitch embroidery!